It’s Monday Night and that means one thing … Football ! And this Monday, November 28, 2011 as the New Orleans Saints take on The New York Giants, country music artist Jimmy Wayne will take the mic and give honor to this great country and what it stands for as he performs the National Anthem. The game begins at 8:30 pm ET and is broadcast on ESPN. Now while every game begins by paying homage to the National Anthem and our great country, be sure to tune in to this Monday’s event and take a moment to become acquainted with the evening’s performer who is truly so much more than a country music artist. Country Music singer-songwriter, recording artist and philanthropist Jimmy Wayne has graced the stages and mics of country music with his outstanding songs and stories. He’s well known for his heartfelt tales in Top 10 hits “Stay Gone” and “I Love You This Much” and Top 20 Hits “You Are” and “Paper Angels” all from his 2003 self-titled debut album. After a short record label change, Jimmy returned in 2008 in a big way with title track and his first #1 hit “Do You Believe Me Now” and Top 20 Hit “I Will” from the same album. In 2009 Jimmy released his third studio album “Sara Smile”, a title and a track paying tribute to his personal introduction to the music industry and to original song artists Daryl Hall and John Oats. All for At Risk Foster Children and . . .
Additionally, Jimmy’s philanthropic passions teamed up with his life experiences and took him on a solo 1700 mile, 7-month trek halfway across America to raise awareness for at risk foster children who age out of the system with no where to go – a postion Wayne himself is all too personally familiar with. That walk, called Project Meet Me Halfway (www.projectmmh.org) started out in Nashville, TN January 1, 2010 and ended in Phoenix, AZ on August 1, 2010. And while Wayne’s “walk” has ended, it’s purpose has just begun to make a difference in the lives of these youths. But Jimmy Wayne’s philanthropic endeavors don’t stop there. He’s well known for his ongoing support of the Salvation Army’s “Angel Tree Program”, a program he himself was a recipient of. He originally shared this sentiment in the “Paper Angels” track off his debut album. And since then Jimmy has endeavored to keep bringing awareness to the Angel Tree Program in his newly released first book “Paper Angels” (Howard Books/Simon & Schuster). This first time author has been featured on media outlets such as ABC World News Now, NBC News, People Magazine, the 700 Club, Crook & Chase, Better TV and more discussing not just the recently released fictional story based on his personal experience but the enormity of what the book endeavors to focus on, the Salvation Army’s Angel Tree Program. Jimmy has also completed writing and recording a new CD. 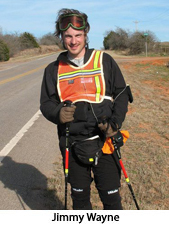 Music from the new recording will be released in 2012, and was inspired by the people he met and places he saw during his 1700 mile walk across America. I so look forward to hearing this, as I can only imagine the heartfelt stories it contains. The Epitome of Selflessness . . . But let that be the beginning of your experience of Jimmy Wayne because believe me, there is a whole lot more to this individual, and he’s just getting rolling ! Jackie Coble ~ Thank you very much for a beautifully written, information-packed comment. I’m sure Jimmy Wayne would be delighted to know of your passion and of your passing these important causes along to others. Hopefully you were able to a catch Jimmy’s National Anthem performance here at Country Music Pride as it was not aired live on television for all the fans that we know were tuned in to watch Jimmy sing. A formidable share, I just seeiifcpd this onto a colleague who was undertaking a little of evaluation on this. And he the fact is purchased me breakfast mainly because I observed it for him.. smile. So permit me reword that: Thnx to the treat! But yeah Thnkx for spending the time to talk about this, I feel strongly about it and appreciate learning far more on this subject. If likely, as you turn into expertise, would you head updating your weblog with additional information? It really is incredibly valuable for me. Massive thumb up for this weblog post! ACTA reformieren?StaatsvertrÃ¤ge kann man leider nicht direkt reformieren, denn sie werden ja gerade unter dem Ausschluss der Ã–ffentlichkeit verhandelt â€“ bloss Regierungsvertreter und Lobbyisten, bei ACTA jene der Content-Industrie, sind dabei. Danach heisst es Â«friss oder stirbÂ».Wer ACTA reformieren mÃ¶chte, muss ACTA ablehnen. Nach einer Annahme wird ACTA nicht mehr reformiert, sondern bloss noch erweitert â€“ das kennt man ja von vielen anderen StaatsvertrÃ¤gen her. Those two are beautiful inside and out. You can’t get a bad picture of them. Their love shines. May it always———–and brighten more each day of their lives. Thanks Dave. Becky is one of my favorite local authors, and when we decided to do several pages for Remembrance Day I thought of this right away. When we redesign the website we are putting in links for local artists and writers, we’ll be sure to include Craigleigh.Here’s a link for now.